Aortic dissection type A is a lethal condition, where the inner layer of the aorta close to the heart is split from the outer layers, creating a false pipe in the blood vessel. This may cause the heart sack to be filled with blood, which can inhibit the heart to beat. Today the damaged part of the aorta is removed and replaced, which is a huge operation for the patient. A stent could be used to push back the inner layer to its original position. The extension of the dissection is however usually beyond the aortic arch with the arterial branches to the brain. Stents of today cannot easily secure the blood flow through side-branches. GraftCraft’s knitted stent fits inside the aorta and smaller stents can be inserted as side branches anywhere. This is possible since the stent is knitted with no fixed side-holes but consists of flexible loops which can slide and give room for branching. 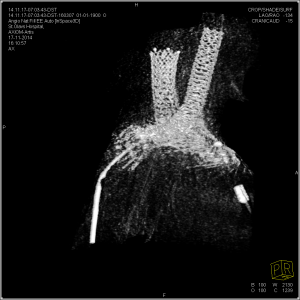 In an animal and feasibility study at St Olavs Hospital in Trondheim, Norway, knitted stents have been implanted in the aortic arch of pigs with additional flexible branching. In the picture to the left, the aorta is depicted in a computerized tomography. The aorta is supported by an unravelling stent, which has been branched by smaller, traditional stents. This is the first time a knitted stent has been branched, opening up for a huge market. By being able to branch a stent wherever it is needed, many patients who today get suboptimal or no treatment can be helped. A method at which the stents will be covered is soon to come.